Steve Oda began his musical education at the age of seven, learning to play slide guitar and then jazz guitar. His love of creativity through musical expression led him to the classical music of North India and the sarode. His practice started earnestly with Ustad Aashish Khan in 1971, and then in 1973 he became a disciple of Aashish’s father, the legendary musician, Maestro Ali Akbar Khan, one of India’s treasures. Since then Steve has dedicated himself to fully learning this complex art form and to carry on the teachings of his illustrious guru. 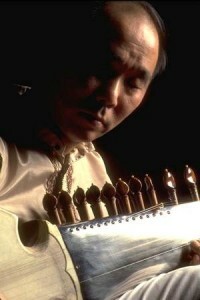 In 1996, he received a prestigious Canada Council Artist’s Grant to pursue intensive studies at an advanced level with Ali Akbar Khan. For over thirty years Steve Oda has been blessed with many international performances that have included such outstanding musicians as Pandit Sharda Sahai, Bob Becker (NEXUS), Ravi Naimpally (TASA), Ty Burhoe, Anubrata Chatterjee, and Vineet Vyas. He has also been privileged to accompany many eminent musicians including Maestro Ali Akbar Khan, Pandit Sharda Sahai, Ustad Aashish Khan and Pandit Anindo Chatterjee. The demand for his playing continues to increase throughout North America as well as in Europe, Australia, New Zealand, Hawaii and, most recently in Japan. Steve moved to the San Francisco Bay area in 1998 and served as Executive Director of the Ali Akbar College of Music in San Rafael, California for a two year period. He currently resides near San Francisco actively teaching and performing the beautiful music of North India. Steve’s performances are available on select recordings including Tala Records 2006 release, “Invocation” and on four CDs: Ragas of North India featuring Ragas Chandranandan and Misra Khammaj, Raga Marwa, Classical Ragas of India, and Classical North Indian Music (out of print). Steve’s parents were Japanese-Canadian born in British Columbia and grew up in the Depression era. Although they never voiced any ill will, they lost everything when their homes and business were confiscated by the government as a result of war hysteria (They weren’t allowed back to the west coast and their homes). Following the war they were relocated to Toronto where Steve was born. Steve grew up post war in Toronto where at that time the community was 99%+ Caucasian. His parents wanted him to have everything they didn’t and at the young age of six they began to notice his love for music (dancing to music on old Marconi radio). Steve really wanted lessons on piano but his parents couldn’t afford the expense so he got music lessons on guitar (steel because his hands were too small to go around the neck of a “regular” guitar). He entered his teen years still in love with music and wanting to be a musician but, because of their upbringing, his parents insisted on a profession and not music. So Steve went to school (U of T) not in music faculty but in the engineering faculty. (His love of music continued since it was by far and away the best way he could express himself.) This love led him to jazz and more guitar-playing. In his early teens Steve developed a passion for music, especially jazz. Falling in love with jazz, Steve started amassing hundreds and hundreds of records, and took overnight busrides from Toronto to New York City to listen and meet the great jazz artists of the day. A special treat was to hear and meet John Coltrane. It was 1963 at the Half Note that he first saw Coltrane with his quartet of Elvin Jones, Jimmy Garrison and McCoy Tyner – on a tiny little stage that divided the club in half. Playing so freely Coltrane introduced him to the wonder of “modal” music and “India”. So free and expressive it struck a chord. Returning to Toronto he tried to play in different kinds of modes and going deeper and deeper into this form of jazz. Steve’s love of jazz and musical expression continued in 1967, he went to a hall in Toronto to hear Indian musicians performing classical ragas: it was the great sarod master Ali Akbar Khan and his son Aashish with the great classical drummer Mahapurush Misra. —Ah, so this was the source of modal music that he had heard Coltrane play.— He went home and started to fiddle with his guitars (steel and jazz) to try to get that sound and improvise in a mode! After finishing his academic education at the University of Toronto in 1968 he graduated from the Faculty of Engineering and became a research engineer for the Research Division of a large electric utility. His career as an engineer during the day fortunately didn’t interfere with his passion for music and Steve continued to teach and play music as much as he could. In 1969 he had the great fortune of meeting Pandit Ravi Shankar in Toronto. Ravi-ji graciously helped him start learning Indian music by arranging lessons in Los Angeles from his nephew, Ustad Aashish Khan. It was 1970 when Steve made his first trip to LA – itself quite an experience! 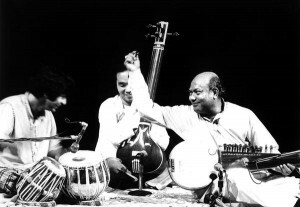 Ravi-ji had made arrangements for Steve to stay with the great tabla maestro, Ustad Alla Rakha, who happened to live next door to Ustad Aashish Khan, the sarod master and eldest son of Ali Akbar Khan. In the following years Steve Oda made a few more visits to LA and, then in 1973 visited the San Francisco Bay area to start learning from Aashish-da’s father, the legendary musician, Swar Samrat Ali Akbar Khan. (Khansahib had recently started his music college in Marin county.) So every year for the next 20 years Steve would travel from Canada to California and attend classes at his Khansahib’s college to learn from the great master. Then in 1993, after a career of more than 25 years Steve got early leave from his engineering work and began his second career to focus more on his first passion – music. With his wife, Pushpa, he moved from Toronto to California (via Ryder truck(s) – but that’s another story) to accept the invitation from Khansahib to become the executive director of the Ali Akbar College of Music. Now here in California he has devoted his life to music, teaching and performing the beautiful music of India around the world! Following Ali Akbar’s passing in 2009, Steve has continued his music studies with Rajeev Taranath, a senior student of Ali Akbar Khan. Rajeev comes to the US annually for teaching and performance.